For the video in this post, I demonstrate rigging a model that is probably modeled more like most models that an artist may be rigging. This model is the character Ian from Steve Shelton and Chris Dailey’s short called “The Coffee Shop Disaster”(that may be a working title). 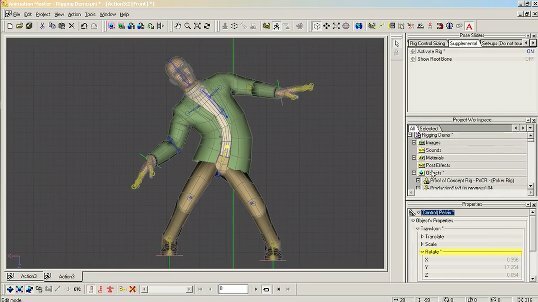 The point to this video is to further demonstrate the concept of the rigging method. Since this is not rig that that will be used in the final short, I don’t spend any time cleaning up the model’s deformations that are caused by rotating its bones joints. Even without the clean up the install process went well. In the video you’ll hear me address Steve and Chris directly but, as in all of the videos on this site, this video is for you too 🙂 .